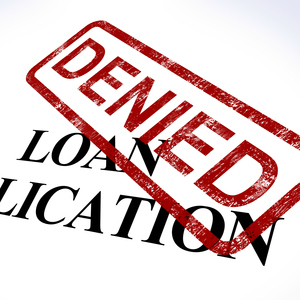 When you are denied credit, the creditor has to explain why you were turned down. You will receive an adverse action letter soon after you are turned down. This letter will tell you why you were turned down, and include information on the credit reporting agency that provided information about your credit history. You are entitled to a free credit report from the agency that provided the information, as well as free access to the credit score that was used in determining your credit worthiness. Write to the credit reporting agency and ask for a copy of your report and score. The adverse action letter should tell you why you were turned down – whether it was an income issue, or a credit issue. If it was a credit issue, you should go through your credit history to see what could be holding you back. If your problem is an income issue, you will need to find a way to make more money if you want to be approved the next time you apply for credit. In some cases, the issue is that you already have a high amount of debt relative to your income. You might still have a good credit score, but the creditor might be uncomfortable straining your income with another debt payment. Paying down some of your debt can help in this instance. When your problem is credit, though, you need to boost your credit score. Check over your free credit report. If you think that you should have good credit, look for mistakes on your credit report, as well as evidence of fraudulent accounts that indicate that someone has stolen your identity. You can clear up these problems and see improvement in your credit score. Sometimes, though, your credit history is legitimately problematic. In those cases, you will need to take steps to improve your habits. The best things you can do are to make your payments on time and to reduce your debt load. After a few months, you should see some improvement in your credit score, and you can try to apply for credit again. You can also get a form of credit that is easier to obtain, such as a secured credit card or a loan with a co-signer. These types of loans can help you rebuild your credit – as long as you are careful to make your payments on time and in full. Should You Apply for Credit Again Right After Being Turned Down? Some consumers turn around and apply for more credit right after being turned down. You have to be careful in these circumstances. Several inquiries in a short period of time can be a red flag that you are desperate for credit. It does take a few days for a credit inquiry to show up, so you might find success if you are quick about applying another time. Really, though, you are probably better off trying to address the problem, rather than hurrying off to try to qualify for a loan again. If you are applying for a larger loan, especially if you plan to apply for a mortgage, you will be better served by planning ahead and looking at your credit before you turn in the application. That way, you can catch problems ahead of time and fix them before you are turned down. Have you ever been declined for credit? Leave a comment and tell us how you worked around it! This article was originally published January 15th, 2013. I have just applied for a credit card and unfortunately I was told by the banker that I had issues with unpaid balances from an existing credit card. What?! I never owned a credit card ever since! Now Im still waiting for a report from the credit investigator’s report and see if I’m really a victim of identity theft. Also, if you are planning to apply for a loan make sure that you are aware the Payment Protection Insurance or PPI. If you have been victimized by missold PPI, try to get more information from a ppi claim back company.